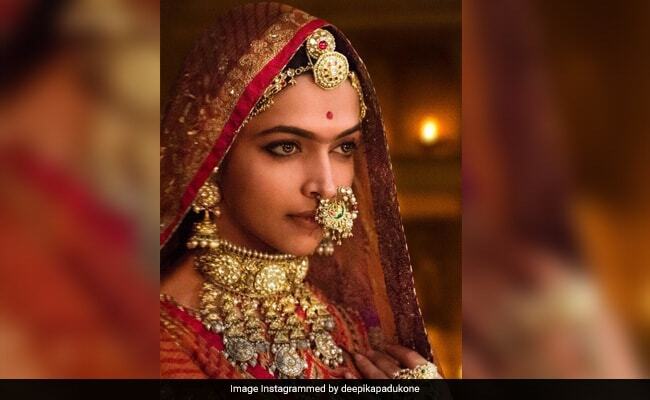 Here's how you can make Deepika Padukone's gorgeous Padmavati look your own! If there's one movie we can't wait to watch, it's Padmavati. A lot of it for the stellar cast and intriguing story and a little bit more for the look. I mean, Deepika Padukone as Rani Padmavati looks nothing short of stunning in the upcoming flick. Makeup expert Chandni Singh of Chandni Singh Studio recreated the look herself and today, she's showing us exactly how to do it. Says Chandni Singh, "For Deepika Padukone's flawless skin in Padmavati, a foundation is required to cover imperfections and give it dewiness. The highlight of the makeup look is the much-talked about unibrow while the eye makeup is minimal, with eyeliner and smudged kajal to add to the drama of Deepika's eyes. The blush is similar to the skin tone and face, mattified along with contouring for a chiseled look. To finish, the lips are in an earthy shade for added drama." Here's a breakdown of Deepika Padukone's look as Rani Padmavati, as recreated by Chandni. Step 1 - For the naturally flawless look with minimal base makeup, prepping the skin is important for which, I've applied the Biotique Morning Skin Nectar moisturiser and Indulgeo Essentials Rose Gold Oil for added hydration. Step 2 - Next, prime the skin with the Smashbox Photo Finish Primer. 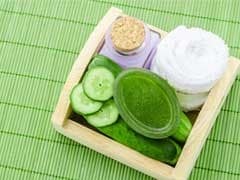 Step 3 - For pigmentation or acne, colour correct at this step. I've used LA Girl Pro Conceal Correctors in Orange and Green for the same. Step 4 - Now, apply concealer over your colour corrected skin. Use concealer that's two shades lighter than your skin for areas under your eyes, jawline, forehead and nose bridge to highlight. I've used a mix of LA Girl Pro Concealer and MAC Studio Fix Concealer. Step 5 - Apply a very lightweight foundation like the Lancome Teint Idole Foundation or LA Girl Illuminating Foundation till your neck and blend with a buffing brush or beauty blender. Step 6 - Set highlighted areas with powder. I've used Chanel Loose Powder for its natural finish. Step 7 - Deepika Padukone's strong yet well blended contouring is what brings the whole look together. For it, I've applied the MAC Blot Powder in Deep Dark under my cheekbones and ever so slightly, along the edges of the forehead and sides of the nose. Step 8 - As it's a completely matte finish look, the concealer highlighting is the only one to opt for. Along with it, apply an earthy toned blush like MAC Melba to your cheeks. Step 1 - Apply an eyeshadow base to neutralize eyelid discoloration and set it with translucent powder. Step 2 - With a fluffy blending brush, apply an earthy brown eyeshadow like MAC Embark all over the eyelid and blend well until the crease. 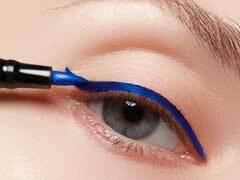 Step 3 - Line the eyes with gel eyeliner with a slight flick to elongate the eyes. My favourite is the jet black, long lasting Maybelline Gel Eyeliner. Step 4 - Line the lower lash line with black kohl and smudge it out slightly with the same eyeshadow we used for the lids. Step 5 - Now for the show stealer, the clean and bold eyebrows which are joined in the middle. I filled in my brows with the Benefit Ka Brow product. Then using the remainder product on the brush with light strokes, I filled the brows together. Step 6 - Apply a natural looking mascara so that it doesn't take away from the entire eye look. Step 1 - Exfoliate your lips by gently rubbing a baby toothbrush and lip balm on them. Step 2 - Use MAC Taupe to line the lips and fill them in. Step 3 - Apply a concealer around the lips to clean the edges and make them look well-structured and sharp.